Sooo I finished my first make of the year, and this one really has been a long time in the making, with the process spanning the last few months of 2014... it's my (almost) final self drafted dress! If this is starting the sewing year as I mean to go on, then I think I'm onto good things! 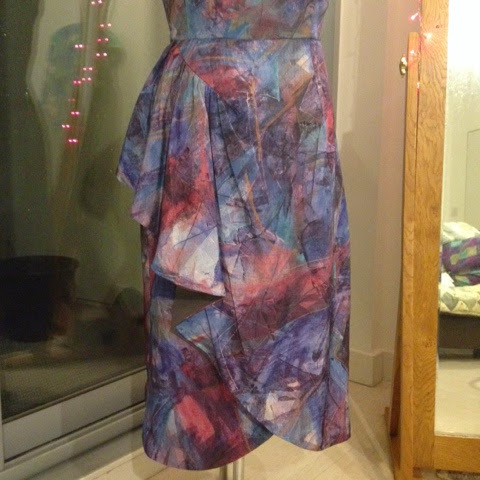 This is a wearable muslin of sorts, made from fabric that I wasn't at all scared to chop into and ruin - it's some sort of viscose/synthetic, drapey stuff that was £4 for 3.5yds from the Hebden Bridge WI Rag market, very late 80s/early 90s no? 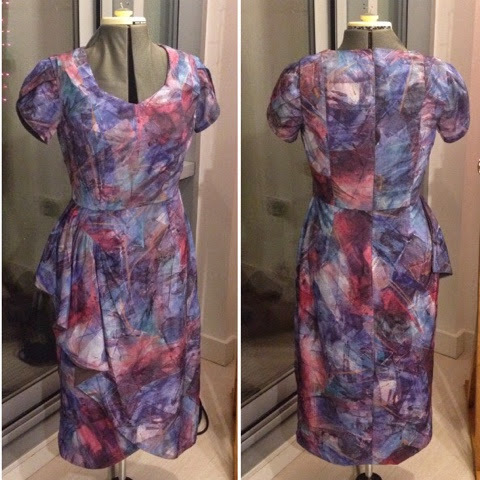 My retro fabric is sort of at odds with the perhaps more vintage design of the dress - it's based on a picture of a Viven of Holloway dress I collected for a mood board - but I'm going to claim that it's all the name of added interest. 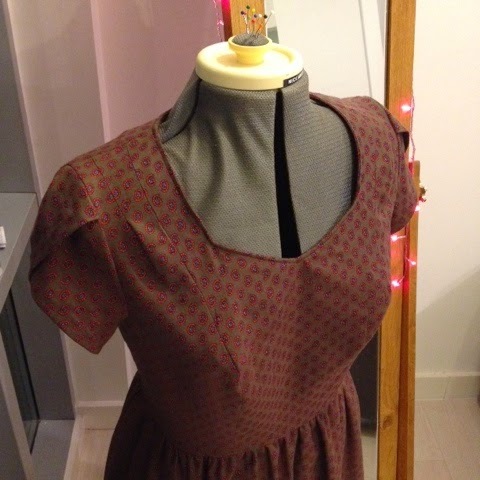 Although I've made and tweaked many a muslin during the pattern drafting stages, this is the very first time I've put the whole pattern, bodice, skirt and lining, together as a finished garment. 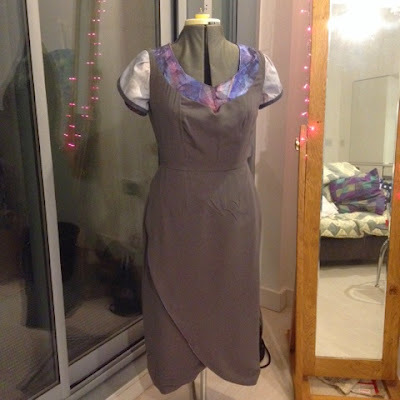 I've already spoken about the most challenging part to fit (the bodice) in an earlier post, where I made it up as a dress with a simple gathered skirt. It was mainly an excuse to use this lovely patterned brushed cotton, and break up what felt like weeks of staring into calico-white-space. The bodice and sleeves have only had a couple of tweaks since then. 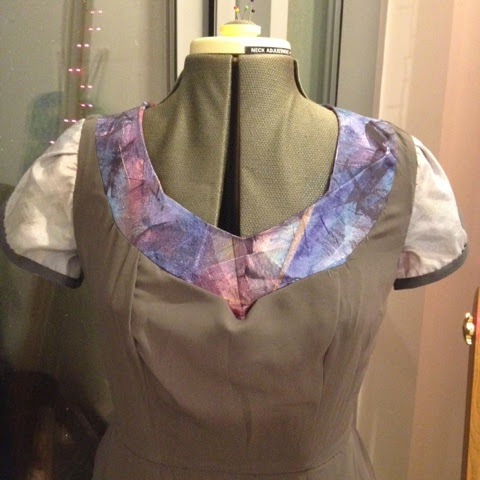 The tulip sleeves pulled a bit at the back during wear, so I lengthened the back-sleeve pattern piece just a bit. This piece then gets gathered in ever so slightly, so it has a bit more 'give' or movement. I also moved the shoulder seams so they sat a bit further forward too. The skirt had to be drafted from a basic pattern block before I could make the draped and gathered tulip skirt that I dreamed of. This is great though, as now I have an overall basic dress pattern that I could make up or play around with - one pattern, many looks! I did some draping and pinning on the model and a little bit of cutting too - I have to say that I was a bit reluctant with the cutting, it took a bit of encouragement of the tutor at the evening classes I went to at college! It helped to give a rough idea of how the finished garment might look, and I could work backwards from the pinned version to understand the pattern pieces I needed. By the time I got to making I just wanted to get on with it, so I hardly took any pictures, sorry! I sort of worked out the skirt and skirt lining pieces as I went along. The skirt lining seems to want to peak out just a little where it's draped at the front, but I can live with that, and I think I'm prepared for what to do when it comes to the final final version. 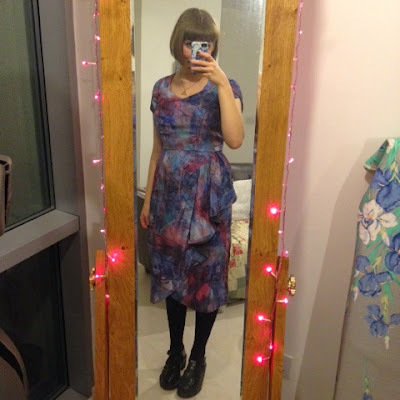 Other than that one one blip, I'm so so pleased with how the dress has turned out. 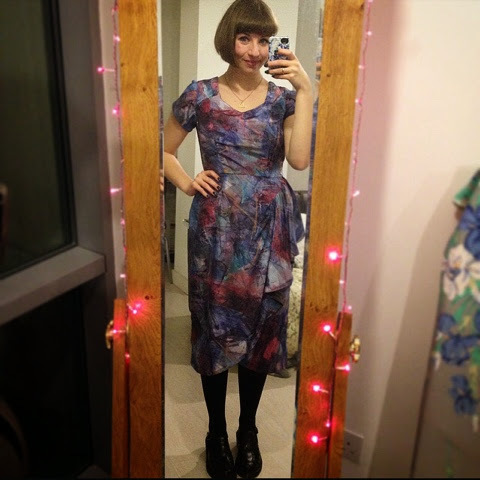 Even though I'd drafted it to fit me perfectly (and tested it) I still had 'the fear' when I was inserting the zip, that it might not do up - it has just been Christmas after all... but it fits, and I feel absolutely fab in it :) Now if only I had somewhere to wear it to! 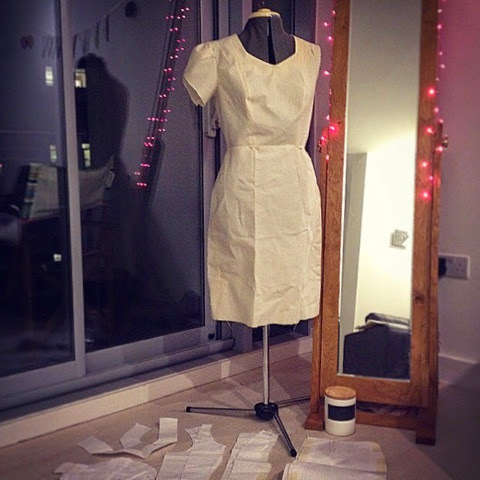 So to round up, pattern drafting takes time, effort and patience, lots of it. But I don't think I've ever been more proud of something I've made and I can't wait to wear it! I've already got my fabric ready to make the final final version. I've chosen a rich teal crepe with a bit more weight to it, and a contrast mustard/gold fabric for the lining (for when you get the tiniest flashes of it). 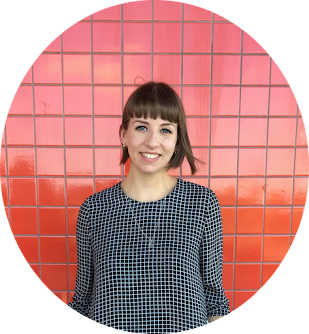 The only thing I'm struggling with is finding a perfectly matched concealed zipper - does anyone have any internet shopping suggestions to help me track down one in the perfect hue? This looks brilliant! I love the tulip sleeves and the flounce. I felt your pain at the bit about the lining. I've been learning pattern drafting too, and it's so much easier when there isn't a seam allowance to think about. 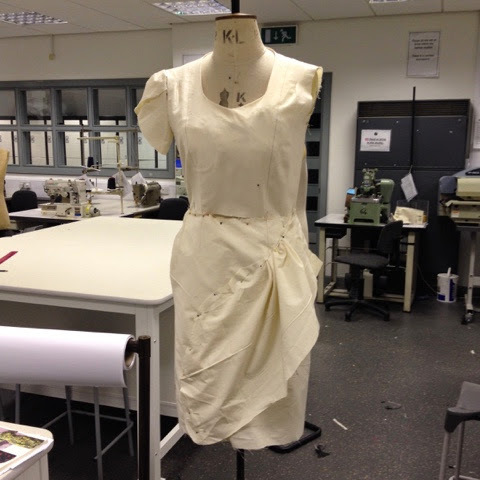 But yey to a beautifully fitting dress, there'll be no stopping you now! This looks fantastic! I really admire all the work you've put into this. Cannot wait to see the finished version. Teal crepe with mustard lining sounds glorious.